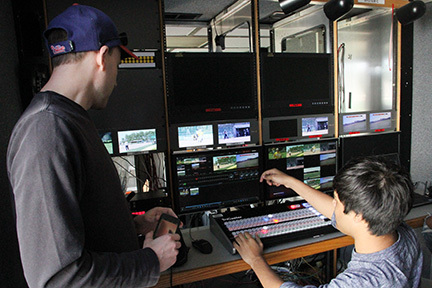 Students with the MCCC Television and Digital Film program working inside the college’s new mobile digital production truck. WEST WINDSOR – Mercer County Community College (MCCC) Television and Digital Film students will be working under the Friday night lights this week, taking the college’s new mobile broadcast unit on the road to produce the Oct. 27 Robbinsville versus Lawrence varsity football game. Students will begin setting up at noon for the 7:30 p.m. contest at Robbinsville High School. The production crew also includes 14 Robbinsville High School students who are dual-enrolled at MCCC. This will be the first football game production for the mobile broadcast unit. The production will be a multi-camera shoot with announcers, on-screen graphics, and instant replay. “The purpose of this production is to help train students for working in a live production environment while simultaneously serving the community,” said Steve Voorhees, associate professor for MCCC’s Television, Digital Film, and New Media program. Voorhees said that due to the lack of an internet connection on the field, the production will not be broadcast live, but will be available for replay on the college’s MCTV YouTube channel. Moving forward, plans are to live stream area athletic events and to wire MCCC’s athletic fields for college sports. In addition, Voorhees said the department is in the process of acquiring a cell bonding unit, a device that bundles multiple cellular phones to form a network powerful enough to handle the bandwidth for streaming video. This will provide the connectivity necessary to live stream events from anywhere in Mercer County, he said. But for now, he said the first step is to get students familiar with mobile production in a live environment. The mobile production unit was made possible through the donation of the truck by PVI Virtual Media Services, and a $100,000 grant from the Dow Jones Foundation for equipment. The truck features a multi-camera high definition fiber system complete with live video switcher, graphics software, two-channel instant replay computer, and a 16-channel audio mixer.